On a given day at Camphill Village we finish breakfast at home and head over to any one of the workplaces in the Village. These can be other houses that need assistance cooking or straightening up, or one of our many gardens or craft studios. We break at noon for a wholesome lunch, followed by an hour of rest, before heading back out to wrap up our workday. Between our sheep, cows, and pigs, responsibly raised livestock are some of our proudest accomplishments at Camphill Village. 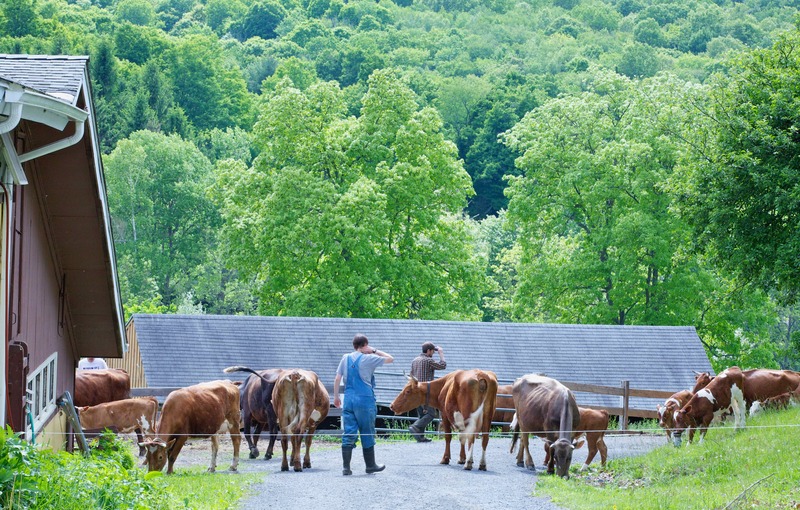 Each morning, our farmers wake up before the rest of the village, and greet our cows in the dairy barn. We milk them by hand before leading them to pasture that we carefully maintain throughout the year. Part of our commitment to biodynamic agriculture entails great attention to the farm as an expertly balanced system, where virtually nothing is wasted. Our pigs’ diets are supplemented with the whey from our butter and cheese production, as well as vegetable scraps collected in the Village. At Turtle Tree Seed, our residents assist in growing vegetables to seed, and harvesting, cleaning, and packaging those seeds for shipment. Part of Turtle Tree’s mission is educating the public on how to save open-pollinated seeds for future use. Turtle Tree is a Demeter-certified biodynamic producer with a dedicated and meticulous crew whose bios can be read on their web site here. What better way to think, relax, and create than to the rhythm of a wooden loom? The weavery is a social place, where our weavers, some of whom are considered “master” level, begin and finish some of the most striking pieces we’ve ever seen. The weavery was one of four work spaces to be completely remodeled in 2015 and moved to a large and sunny central location in the village, along with the candleshop, stained glass shop, and bookbindery. We are sincerely appreciative to our donors, who made these improvements possible. Our bakery is one of the most beloved places in our Village. Like our other work places, it is built around an image of the complete process: from grain grown to loaf offered, rather than production through assembly-line tasks. As many as twenty bakers work throughout the day — some rising early, some coming in later — to make bread, rolls, cookies, biscotti, granola and pasta for local delivery and farmers markets. A number of local businesses take our cookies and granola as far south as New York City. We take an active interest in collaborating with regional growers and producers toward a sustainable and diverse grain economy. As part of this effort, we have sourced more than half of our total grain from local organic or biodynamic sources. From tender greenhouse lettuces to hardy root crops, our gardeners feed our Village. Each week, they stock the shelves of our garden market, where everyone at Camphill is welcome to pick up what they need for themselves or for their households. An abundance of meats and greens that are grown on the property are served at every meal. Foods grown and raised in the Village are also served in our Coffee Shop and in the Café, which are open to the public. The sweet scent of beeswax invites you into our candleshop before you reach the door. Rather than petroleum-derived paraffin candles that represent a vast majority of candles sold in the U.S., our all-natural beeswax candles burn brighter, longer, and require no additional perfumes. Our candlemakers pour melted wax into their handmade molds, and display great patience in adding layer upon layer of colorful wax to their hand-dipped taper candles. The bookbindery is one of the village’s earliest work studios. Now located in the new studio cluster, our bookbinders produce blank journals, decorated matchbox covers, sketchbooks, and wrapping paper. There is always a new creative process being explored in the bookbindery, from adding dried lavender petals to their handmade paper cards, to creating compressed paper bricks for the village’s fireplaces. Our woodworkers take great pride in producing attractive and functional cutting boards, furniture, and children’s toys. The early founders of Camphill Village were kind enough to plant a larch tree plantation on our property, which has been an excellent source of wood that we can harvest sustainably within the Village. Any woods that aren’t harvested on Village property are reclaimed pieces that have been donated to us, ready to be transformed into a serving platter on our gift shop shelves, or into wooden building blocks in a child’s playroom. Vibrant mountain scenes, stars, and other illustrations grace the windows of our stained glass studio and surround our artists while they work. Beginning with creating an original design, the stained glass crew chooses the colors of glass that will melt into the lead frame, and polishes the finished product before it goes on sale in our gift shop. The Healing Plant Garden is an enchanting place, where honeybees buzz around blooms of lavender, mallow, and other plants that are prized for their medicinal benefits. Since 2002, the Healing Plant has been Demeter certified, the highly respected standard for biodynamic agriculture. Flowers and herbs are harvested by the Healing Plant crew and are then transformed into creamy lavender lotions, salves, ointments, culinary herb mixes, and aromatic room sprays here in the Village. Managing 600 acres is no small undertaking. Unlike the Village’s other workspaces that are generally in one place, the Estate Crew is all over the Village, taking care of us. They clear tree limbs and other debris from our roads and foot paths, they responsibly manage our forests to make sure we all have enough firewood for the winter, they shovel snow so our walkways are safe and accessible, and they perform the sweetest task of all: tapping the Village maple trees and making hundreds of gallons of fresh maple syrup in the spring.